“It feeds into this growing belief that Scott Morrison might be all spin and no substance." ScoMo also posted the latest in a series of videos to Twitter, this time to give a shout-out to surfer Mick Fanning’s mum to thank her for a Rip Curl hat. Madigan said his videos, which have been the subject of some backlash, aren't doing his reputation any favours. "His videos have certainly contributed to that a little bit. I think people have been watching him like, ‘really?’ This feeds into this perception that there might not be a lot underneath," she said. Over a decade ago, ScoMo gave the green light to the 'So where the bloody hell are you?' Tourism Australia campaign, holding the position of managing director at the time. The campaign, being highly controversial, was said to be one of the reasons he got the boot. Hack host Tom Tilley questioned Madigan if she thought ScoMo was using hallmark slogans in a throwback to his marketing days. Scott Morrison is on a mission to market himself as a “fair dinkum”, true blue Prime Minister but communications expert Dee Madigan doesn't think his strategy is going to move the dial. 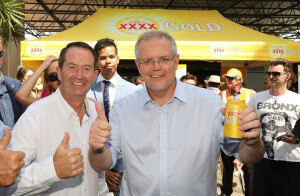 This week, ScoMo has been on a tour of the Sunshine State riding his ‘ScoMo Express’ bus and even attending the Melbourne Cup races yesterday, pictured drinking a can of XXXX Gold. He’s hit the airwaves to give a string of FM radio interviews answering questions about his first pash, held a photo op at a meat pie factory and put out a playlist of his favourite dancefloor hits. Experts have suggested his four-day blitz through Queensland is the start of a marathon election campaign. Madigan, ECD at creative agency Campaign Edge, sees through the marketing strategy employed by ScoMo who is attempting to position himself as a regular, relatable bloke. “It is really hokey. The trick to marketing politics or the trick to marketing anything is making people feel like they aren’t being marketed to and this feels like the Demtel tour of Queensland," she said on Triple J program Hack yesterday afternoon.